Keep the bar stocked and the shot glasses handy! Roll out the mat and enjoy your favorite spirit in style! 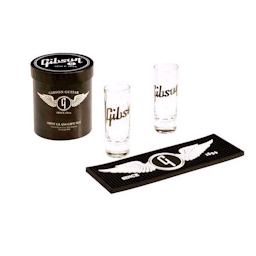 This Gibson Shot Glass Set is a great gift or collectible for your favorite rocker. Each set comes with two hand-blown 2-oz.shot glasses and a matching beverage mat adorned with the “Flying G” logo.